Ride the Flavour team started out its world tour! Only then did we fully realize the scale of our project. Our parents were already here. Few minutes later, Sandrine Lavigne, founder of Planicook, sponsor and fervent supporter of Ride the Flavour joined us. The media also came to cover our departure. We spent more than 3 hours explaining our project in front of journalists and cameramen. 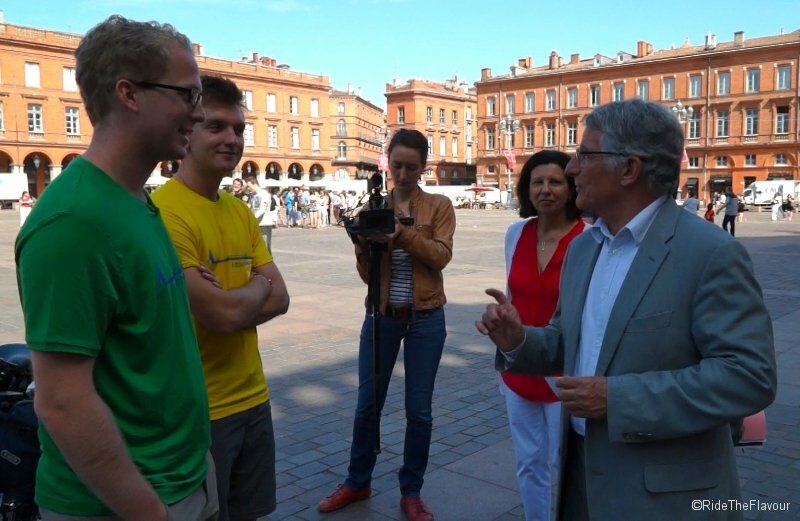 The mayor of Toulouse and his first assistant came to meet us. A little tense by so much attention at the beginning, we then played the game and discovered with pleasure the enthusiasm which our project arouses. Full of spirit, we discussed successively with 3 groups of journalists. Thank you for your coming! We have now started to ride. In front of us : a 20 000 km-road. It will cross 27 countries and make us discover fabulous cultures, delicious recipes, passionate associations and above all amazing meetings! The tour around the world of flavour by electric bike is on! Ride the Flavour team is now pedaling across the world!